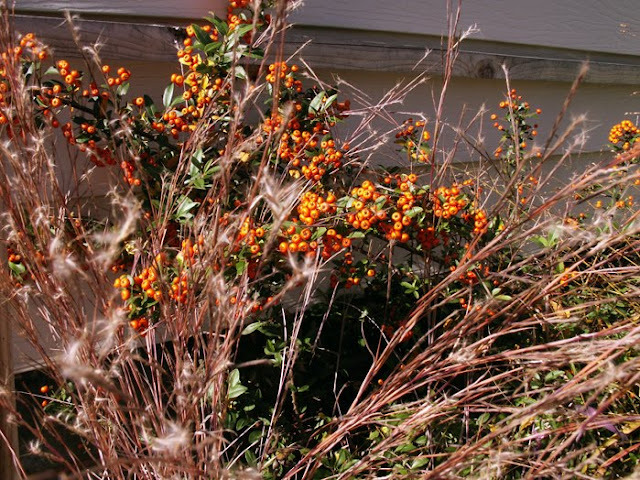 Orange Pyracantha berries behind a screen of 'The Blues' little bluestem. My tiny blueberry bush (can you see its red leaves?) 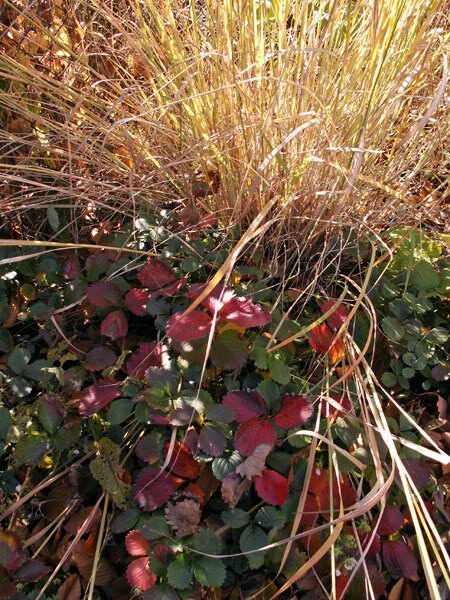 surrounded by lemongrass, 'Rotstrahlbusch' switchgrass, pineapple sage, woolly thyme and Japanese bloodgrass. 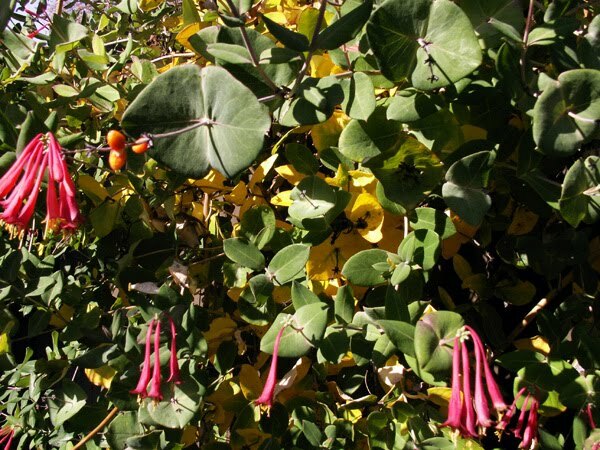 Lonicera sempervirens combining more tubular flowers with bright yellow fall foliage. 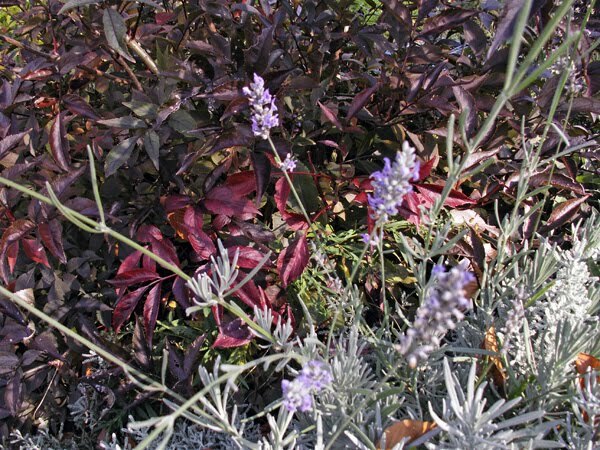 'Black Beauty' elderberry, with still just a few burgundy leaves hiding behind the 'Grosso' lavender. 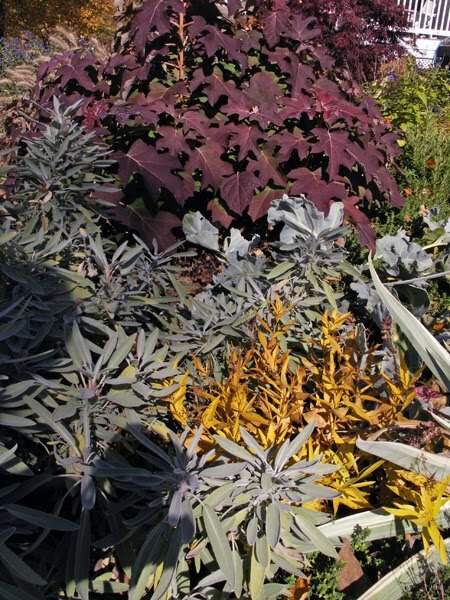 My new fave tall sedum, 'Hab Gray,' with yellowing leaves behind the drying flowerheads. 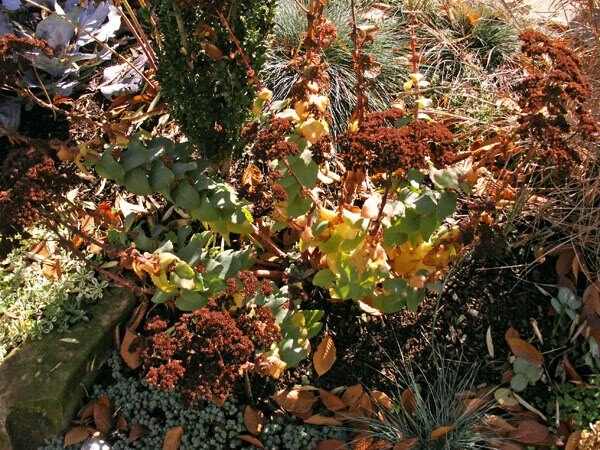 Surrounded by 'Sky Pencil' Japanese holly, blue fescues, variegated silene, and the tiny sedum hispanicum. 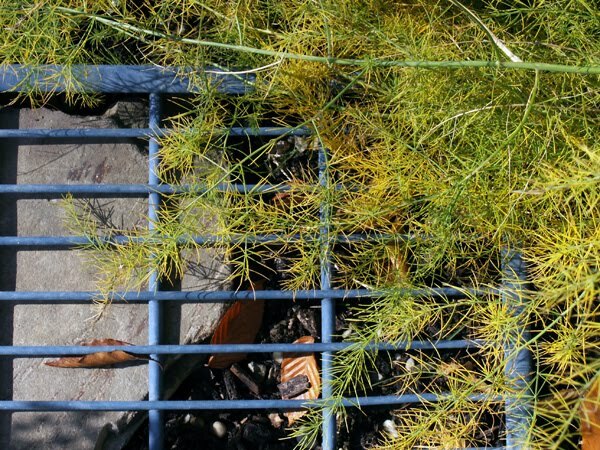 Asparagus, with its yellowing foliage falling over part of the blue footbridge. 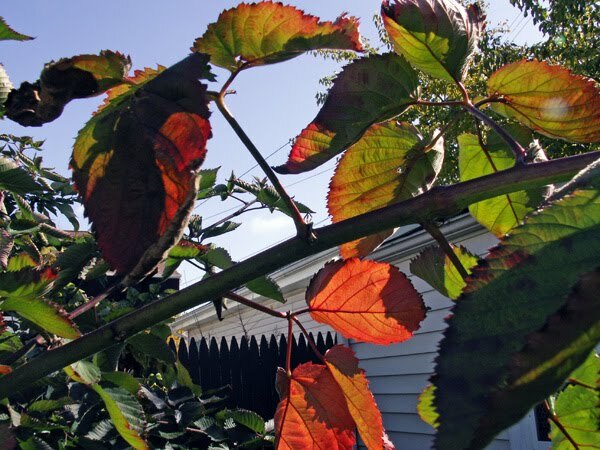 The reddening leaves of my thornless blackberry. Alpine strawberry 'Ozark' shows flowers and red leaves at this time of the year, and fall berries seem to have a little more tart with their sweet but are still delicious. 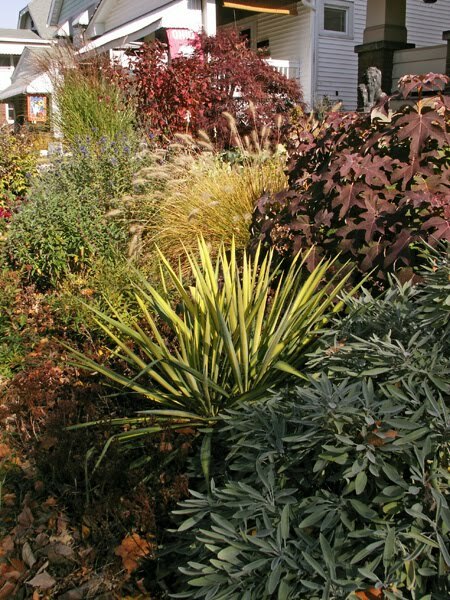 Above, 'Sioux Blue' indiangrass. The front yard garden is almost a riot of colors... in a bad way! But too soon we'll be left with the gray and brown-gray of a typical Cleveland winter, so I love it. 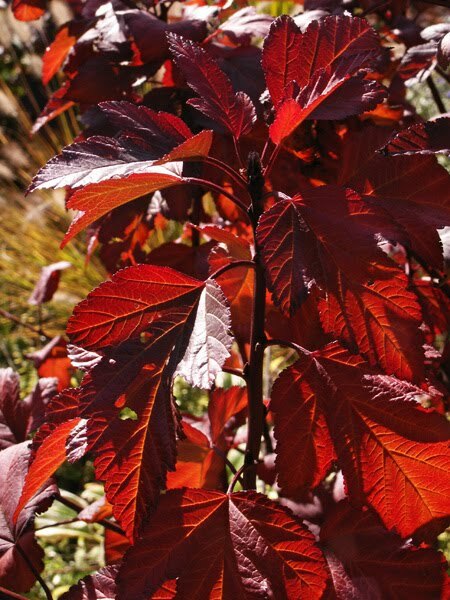 'Diablo' purple ninebark is definitely this week's show-stealer, with its blaze of red leaves backlit by the afternoon sun. 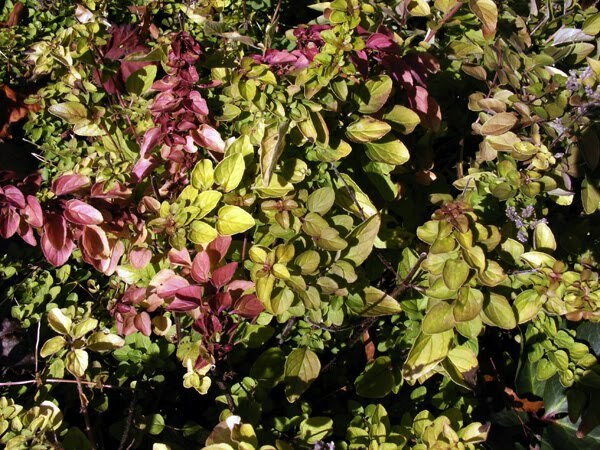 No plants seem to want to be left out of the fall show here: Even the golden oregano is tinging pink on the edges! I love backlit grasses, so I try to choose sites for them where they will be between me and the sun as much as possible. 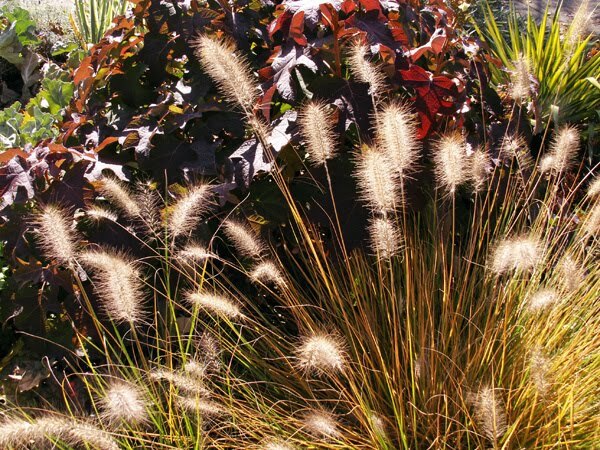 Here 'Hameln' pennisetum shines against the deep fall color of my oakleaf hydrangea. 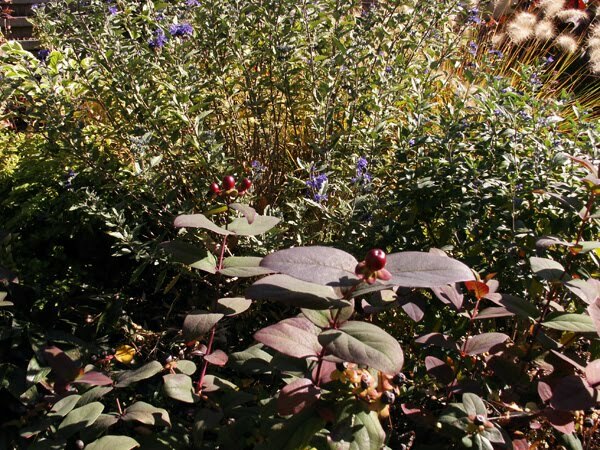 'Albury Purple' hypericum (St. John's Wort) has leaves tinged with purple year-round. But it looks particularly great in Autumn when capped off with berries (and even a few new blooms... I think the caryopteris behind really sets it off. Not all fall color is pretty! Here echinops ritro is seen turning yellow--and brown and crispy--all at the same time. I couldn't get my arm and camera out of this pic (sorry) but a single hybrid amsonia is shining brightly--along with the oakleaf hydrangea--among a neutral palette of sage and sea kale. 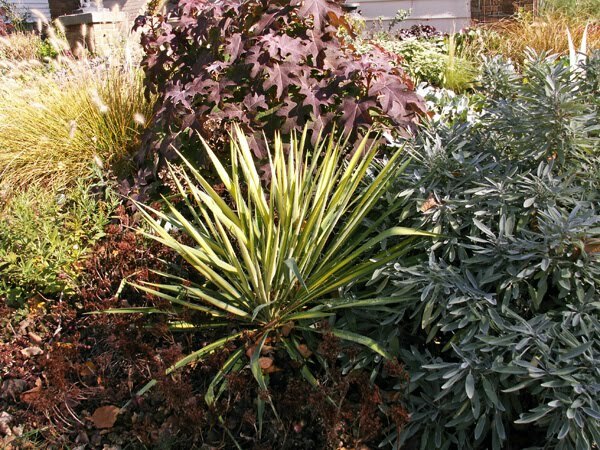 Another year-round shiner is 'Golden Sword' yucca. See the hybrid amsonia to its left? It's the same kind as the blazing yellow beauty above, so I have no idea why it and its neighbor are still green... maybe they decided to take turns this year! A last parting shot: My front yard garden as it looks from the corner of the driveway. Now, off to work on doing a little more cleanup here--including adding in some much-needed "chunky" foliage in the area behind the oakleaf, to offset all of this fine-textured stuff a little better. You always have the best color,texture combos Kim. I really like that yucca. I will have to try to find it. 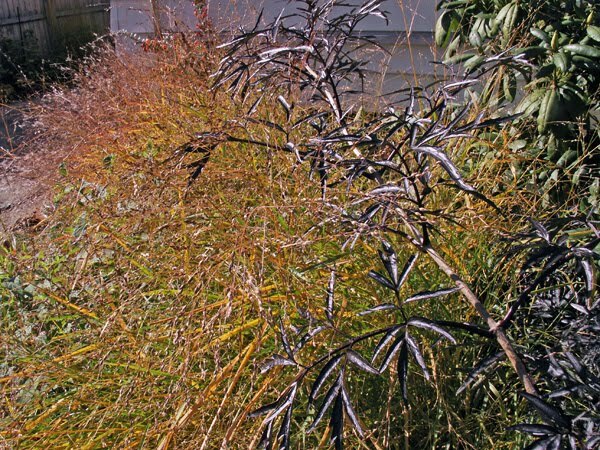 My amsonia isn't turning color this fall yet either. I wonder if all this rain has something to do with it. I am behind in the garden and it is raining again today. Hey Kim, you still have so much colour in your garden, amazing! I especially like the contrast of the golden asparagus against the blue footbridge. Your front yard is smoking! I wish I lived across the street from you. 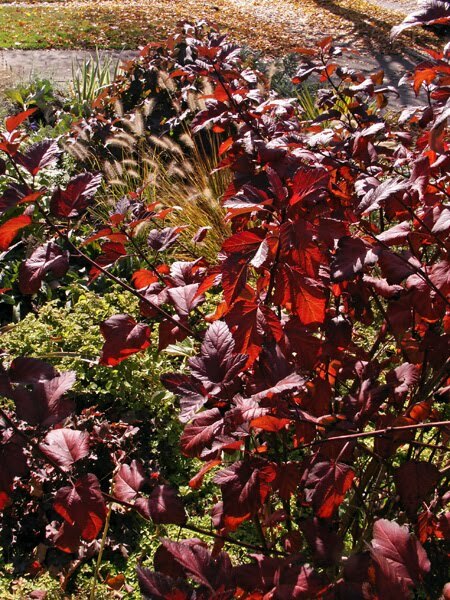 It's funny how my Oakleaf Hydrangeas are both behind yours in turning, but my Physocarpus Monlo/Diablo is almost blown. I know you love Black Lace Elderberry, but I think I prefer Black Beauty. (Not that I have either one.) I''m not sure why. 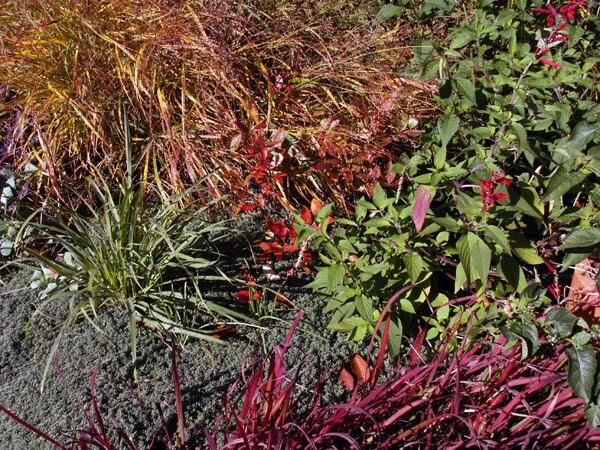 You have a great selection of grasses, and they look great now. Clearly, I don't have enough. 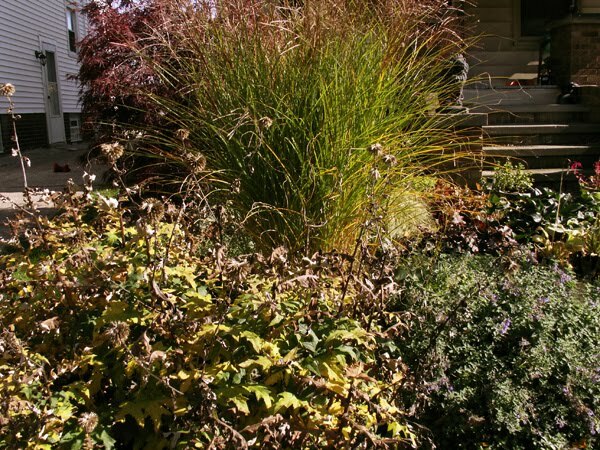 Next spring, I'm going to plant a Panicum. I don't know which one yet. Greenbow Lisa, there are a few other pretty golden-variegated yuccas, too. I like the plain old green-blue ones as well, but my next door neighbor has one that I "claim" since it's within sight... lol. You might be onto something with the amsonia. The one that is colorful probably has a little better drainage, and certainly probably stays hotter since it's nearer the cement driveway. Kilbourne Grove Deborah, I love that golden asparagus, too--the color is a bonus, as I just planted it to eat. :) Btw, we're way behind here in the fall (Lake Erie moderates our fall weather since I'm within a few miles of it) but in the spring, it has the opposite effect--my spring comes WAY late, it seems! Mr. McGregor's Daughter, I actually PREFER the Black Beauty elder, too! In fact, I only bought the 'Black Lace' when I discovered that it would cross-pollinate with my 'Black Beauty,' because I wanted elderberries. I think that you and I are the only two people who feel that way, though. Someone has been very busy, I see :) Great autumn garden photos and as always, a delight to visit, dear Kim. Happy Halloween!